It's obviously normal to have good and bad days. The highs and lows come in very many ways, like moods, races, and how you feel. And while it's rough to have those poor days, and feels fantastic to have those really good days, I find in the long run that it is best to set a line straight through the middle. Coming out of the U16 camp, I was in a high. I had put in some excellent training, good distance, intervals, running and skiing alike. The week I got home, I planned for a little higher hours than usual for the week, but low intensity so I would be ready for a couple races and time trials towards the end of the week. Sometimes it's hard to move in the mornings. Especially when your legs are stiff, core is cramping, and your shoulders are aching. And when it's so humid that you are sweating before you even get out of bed. So far, the U16 development camp has been amazing. We've been here at the University of Vermont for 3.5 days, but it seems like we've been here much longer than that. Besides the scattered pickup soccer and ultimate games, the coaches have been working us hard. We did a easy ski on Saturday, some drills in the afternoon. Sunday we did an uphill time trial in the morning and easy run in the afternoon. 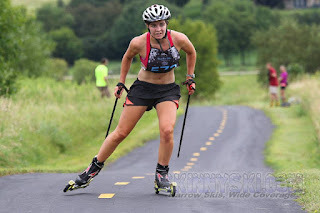 Monday (today) we did an easy ski at the Rollerski Track at the National Guard base about a half hour away from UVM and a strength test in the afternoon.